The Professional Leadership Certificate will provide you with increased awareness and understanding of leadership and will enable you to become a more effective, evolved leader. You will explore the philosophies of a well-rounded leader from a career and personal perspective. Specialize in Career Development or Personal Development to customize your Certificate to your career direction. Professional Leadership Certificate courses can also be taken as individual professional development seminars to brush up on your know-how or adding new skills to your professional repertoire. 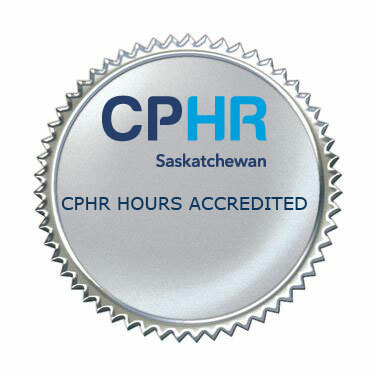 We are an Accredited Partner with the CPHR Saskatchewan for HR courses in the Professional Leadership Certificate. You will learn how coaching employees, as part of an overall leadership strategy, encourages a supportive and collaborative approach toward high performance, that is more effective than directing or controlling. You will learn the difference between coaching and mentoring, learn a model and principles for effective coaching, and practice putting theory into action through applied activities that account for differences in employees' personality types, work styles, generational differences, cultural diversity and work situations. In this course you will learn about the role of the supervisor and the appropriate leadership techniques for obtaining cooperation and commitment through the use of effective communication. You will examine communication at its core and develop a practical road map for communicating effectively and efficiently through any conversation and in any situation. This course provides participants with the necessary knowledge and skills required for building and maintaining effective work groups/teams. The concept of team and its application to organizational success will be discussed. An examination of inter-relationship between the work to be a accomplished and the people who deliver the work in order to insure organizational effectiveness will be processed. The stages groups go through and role of the leader in each of those roles will be discussed. Participants will have an opportunity to assess their leadership competencies and plan for their development. Finally, participants will be able to experience using general consensus while going through the core steps of the team development process in creating vision, mission statements, and values. You will learn how transformational leaders focus on 'transforming' others to enhance the motivation, morale and performance of their employees. You will explore how the leader's personality, traits and ability are used to institute change through vision and goals. You will learn the series of phases that a successful change process must go through. You will learn how to get the organization's attention for this needed change, create a vision of what would happen if the change is achieved and identify others with the skills, attitudes and reputations you need for buy-in. This course provides participants with core tools and techniques in leading and motivating today's employees in order that they can be effective individually and collectively. Concepts such as the role of the leader in establishing trust relationships, assessing leadership style, establishing personal leadership mission statements, processing various motivational theories and their application to the workplace will all be discussed and processed in this course. The overall purpose of this course is to provide participants with an opportunity to understand and improve themselves personally and professionally, in order that they may become more authentic as individuals and leaders, and achieve greater results. The course is self reflective throughout. The following areas will be introduced and processed: what's going on in organizations today; what is leadership; what is authenticity; assessing your four intelligences; clarifying your values; creating a leadership vision statement; how to be credible; establishing your code of ethics as a leader; the importance of influencing others; leadership and power; principled leadership competency assessment; and transferring learning back home. The final piece to personal leadership development and to understand the purpose of your own leadership style is to create the Personal Leadership Development Plan. This plan will help guide you throughout your professional and personal life.